You’ve had a peek into some seriously beautiful women’s closets here on the blog, but what about those guys? Men’s closets are such a treat to organize because, in my professional experience, these spaces aren’t overcrowded and only contain the necessary / basics. In general, the men who have hired me are pretty ruthless about de-cluttering too. Almost no emotional connection to their stuff. Unless it’s that old band or frat t-shirt they can’t part with. These closets are easy, fun projects and require minimal containment. Men don’t have as many frills as women – no jewelry, no heels and little-to-no accessories. Last week I had the pleasure of not only re-organizing the closet of the sweetest guy I know…but I organized his space with the new line of home organization accessories from The Laundress! Like any other organizing solution I would recommend or stand behind, this line minimizes clutter and maximizes space – stylishly! The suit storage bag safely keeps his suits and sportcoats dust-free. It’s a rare opportunity to organize a men’s closet so this project was a nice change to the usual. And I loved sharing the new line of home organization accessories from The Laundress. You can see the entire line here and don’t forget to check out that Le Labo detergent!! 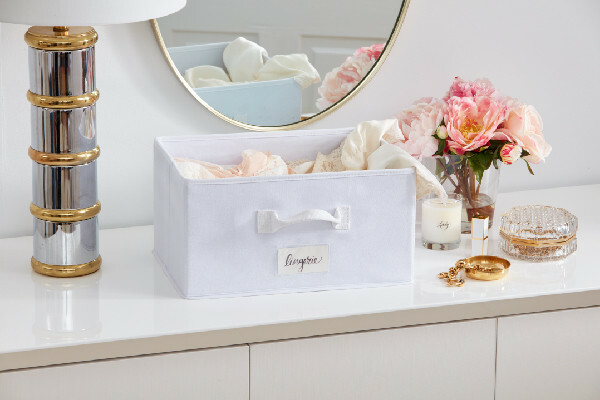 *The Laundress did send these pretty storage accessories to me at no cost – however, I organized the closet myself AND everything shared here is my opinion and written in my own voice. You pay nothing more by clicking any links in this blog post and I won’t make a commission on anything you purchase. Just saying… Thank you to The Laundress for partnering with Simply Organized! I could see the double laundry sorter also being great for traveling by car. It would be an easy item to pack, cut down on a little extra work when back home, and easy to throw in the car! SUCH a great idea!!!!! I love thinking outside the box! 1. Do you recommend California closets? or another provider? Did CA closets in a 1 bedroom in downtown Boston, but it felt cheap…or maybe that was just my taste. 2. Any golf/tennis storage area organization tips? I’m overwhelmed with golf balls, shoes, tennis balls/bag, and the like, all in a too small area of a way too small garage and looking for a quick suggestion until we build a new garage. Great to meet you this weekend – don’t ever worry about approaching me in public / around town. Am happy to help with free advice! Thank you to Jill for sending you my way too! 1. Personally, I wouldn’t recommend CA Closets. While their closets are beautiful, their core isn’t so hot. And it’s a little painful for me to see families spend THAT MUCH money on a closet that isn’t solid to the core. I’ve never designed a CA Closet, but I have organized in their closets multiple times…each one has peeling issues and other problems. Maybe their material has improved? ?…you may want to visit their showroom to ask. Bay Home & Window is a closet company I have worked with quite a bit. Great material…a little pricey still, but you’ll get a discount by mentioning my name and that I referred you. Jeff Johnson is my guy there. Valet is another great company and they recently opened a showroom in The Livery. They are the top of the food chain when it comes to closets, as far as I’m concerned. Exceptional work but costly. 2. As far as tips on this one, I’d have the see the space first to determine the best suggestions. Could be free-standing or wall mounted…but I’d have to see to give you something solid. Let me know if you want me to swing by! Thank you again for being a long time reader!!! Glad you left a comment and glad you introduced yourself the other day! I never enabled the email alerts on my original comment, so sorry for the delay. Yep – you hit the nail on the head on CA Closets. Looks nice, feels cheap. I think it’s basically plywood with a veneer on top. Reminded me of Jersey Shore fake tan (with less orange). I used them on a condo in Boston and it came out nice, but you’re right – it just didn’t “feel” great. Never had any issues with peeling, but, given the veneer, I can see that happening. It’s a rental now, so looking nice but being a bit cheaper is fine. I loved your landscape before and after so here’s the closet before and after (small closet, but in downtown Boston, you don’t find a lot of closets you can stand in). Shoot me an email if you want more before and after of the unit, was a ton of fun to gut. As far as the golf gear set up, we’re probably going to do a whole home gut next year, so may want you to come help us do a garage from the ground up. But the current garage is basically a golf cart and kids stuff…not worth organizing when it’ll probably be rubble in 6 months. I love those hanging racks for storage though, great use of vertical space. I’ll probably add extra height in the garage just to add some of those!